Amsterdam /PRNewswire/ -- Royal Philips (NYSE: PHG, AEX: PHIA), a global leader in health technology, announced today it has expanded its General Care Solution, which comprises patient monitors, wearable biosensors, and clinical decision support algorithms, with the new Philips IntelliVue GuardianSoftware mobile client application. The mobile app has received 510(k) clearance from the US Food and Drug Administration (FDA) and leverages the capabilities of Philips' General Care solution, which includes Early Warning Scoring (EWS), to provide clinicians with the benefit of mobility and optimized workflows. In some hospital medical-surgical units, patient information and color coded early warning scores are written on a centrally located whiteboard used to notify clinicians of changes in patient status. This can sometimes lead to inefficiencies and delays in care as clinicians are not receiving important updates in real-time. With the introduction of the IntelliVue GuardianSoftware mobile client application, clinicians can now view patient vital signs, collected via compatible devices like the wearable biosensor, and early warning scores on their mobile devices. The IntelliVue GuardianSoftware mobile client application can help notify clinicians to signs of potential patient deterioration before an adverse event might occur, supporting them to more efficiently intervene and focus on those patients who need their attention. "Patient deterioration continues to be a major concern in hospitals – one that can be further exacerbated when the right solutions aren't in place," said Felix Baader, Business Leader, Monitoring and Analytics, Philips. "Clinicians need data in real-time to help them identify adverse events before they occur. Philips IntelliVue GuardianSoftware is always evolving to offer clinicians an intuitive tool to optimize efficiencies and clinical resources. With the introduction of the IGS mobile client app, clinicians can deploy resources more efficiently, and have a deeper view into their patients' status." Philips IntelliVue GuardianSoftware allows clinicians to view patients' vitals and access graphical trends to track their conditions, with a real-time view of compatible devices to manage EWS vitals input. The technology gives clinicians the ability to track the number of patients in a unit and receive automated event generated notifications, including bed exit and fall notifications, delivered directly to their mobile device. The IntelliVue GuardianSoftware mobile client application is configured to meet caregiver preferences, including the ability to acknowledge they have seen active notifications. 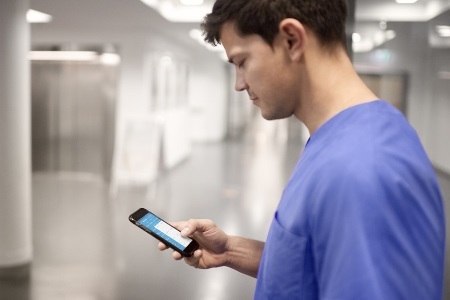 The Philips IntelliVue GuardianSoftware mobile client app, specified for Android operating systems, is the latest example of Philips mobile solutions empowering care teams across high and low acuity areas to deliver notifications directly to the caregiver's smartphone. It is available for sale in the US and Canada. It also complies with the EU Medical Device Directive and carries the CE marking accordingly. Philips IntelliVue GuardianSoftware leverages intelligent algorithms and predictive analytics to help clinicians identify patient deterioration, notify caregivers and enable appropriate, timely intervention to prioritize patient care. Philips' industry-leading monitoring and analytics portfolio addresses all acuity levels and care settings within hospitals and health systems, and supports a broad patient population – from basic screening to complex surveillance in critical care. It includes bedside and wearable patient monitors, consumables such as connected wearable biosensors, and clinical decision support tools and mobile applications for real-time clinical information at the patient's bedside. More than 275 million patients are monitored each year with Philips' patient monitoring solutions.